by Carnival Lady & filed under Food Service. 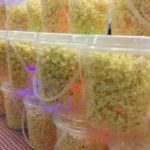 Our glow popcorn tubs add flare to the food stable at your event. They are perfect for Halloween events and indoor glow events. by Carnival Lady & filed under Entertainers, Entertainers for Adults. 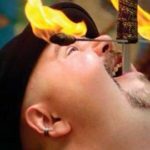 Captivate the audience with a Sword Swallower at your next event. 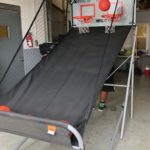 This entertainment would be perfect for a circus themed event. by Carnival Lady & filed under Sports. 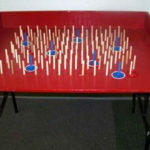 Our Electronic Pop A Shot is like the arcade game that scores the double player hoops competition. This is a perfect game for an office party. 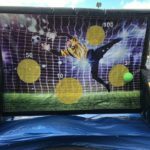 Test your soccer kick accuracy with the Sticky Soccer. How many points can you score with your goals? This is a perfect game for all soccer enthusiasts. by Carnival Lady & filed under All Ages, Inflatables, Water Play. 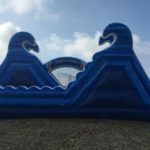 In the Surf N Run, you will do a complete 180 and enjoy two slides. This water slide is for one person to enjoy at a time. by Carnival Lady & filed under Attractions, General Attractions. Take a ride on our Smiles Express Trackless Train. 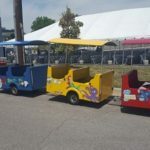 This fun train is great for families to enjoy and includes a conductor/driver. by Carnival Lady & filed under Midway Games, Standard Midway Games. 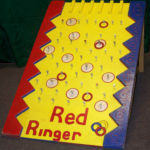 Player tosses red rings at the target board trying to loop a marked target. GOAL: Difficult, 2 out of 3 rings on targets wins. Easy, 1 out of 3 rings on target wins. In the Ring Toss game, players have 5 attempts at tossing a ring and landing on a blue circle. GOAL: Toss a ring and land on a blue circle to win. by Carnival Lady & filed under Midway Games, Upgraded Midway Games. A version of everyone’s favorite midway game. 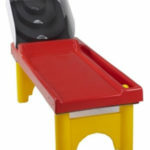 See if you can accurately score enough points to win the Skee Ball challenge. by Carnival Lady & filed under Scenery. 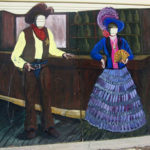 Rent our Western cutouts for a great photo opportunity at your next Hoedown!